The 2019 Subaru Ascent is an all-new crossover sport-utility that replaces the Tribeca. Subaru kept it simple insofar as powertrain choices are concerned, with one engine offered, a turbocharged 2.4-liter four-cylinder; one transmission, a continuously variable automatic (CVT), programmed with simulated shift points and the option of manual operation; and all-wheel drive as a standard feature. Despite the singularity of the powertrain, the Ascent’s EPA fuel economy projections cover a small range, contingent on trim levels: 20-21 mpg City, 26-27 Highway, and 22-23 Combined. There are four Accent trim levels, with a choice of seating for eight passengers (center row bench seat) or seven (center row captain’s chairs). The Ascent entry model ($31,995) seats eight. Standard features include Subaru’s Eyesight safety system (auto emergency braking, reverse auto braking, lane departure warning and assistance, blind spot monitor), hill descent control, LCD instrumentation, Subaru Starlink infotainment/connectivity with a 6.5-inch touch screen, Apple Car Play and Android Auto, Pandora and Bluetooth, 6-speaker audio. Ascent Touring edition ($44,895) seats seven, and includes coffee-colored leather upholstery, perforated, heated, and ventilated; Subaru’s Starlink infotainment with navigation; and a 792-watt Harman Kardon surround sound audio system with 14 speakers. Having taken some chances with the Tribeca, the Subaru design team stayed closer to established corporate styling norms with the Ascent. The result is a new SUV that looks like a bigger version of the Outback. This is not a bad thing. The Outback has been one of Subaru’s bestsellers ever since its introduction for the 1995 model year. Beyond that, the 8.7-inch ground clearance and standard roof rack suggest a rugged, go-anywhere persona, a la Outback. The rear liftgate is powered (Premium trim and above), with a height memory feature, and the Premium option list includes a panoramic dual pane power sunroof. The basic Ascent rolls on 18-inch alloy wheels; 20-inchers are an option for the Premium trim, standard with Limited and Touring models. The ultimate test of any three-row SUV is the viability of that third row seat. In that respect the Ascent rates as ordinary. Two good-sized people might achieve happiness back there for awhile, but cramming three into that rearmost perch would require diminutive individuals and a bottle of Mazola. However, the Ascent’s third-row volume is mitigated by the second row seating, which provides a substantial range of fore-and-aft adjustability, whether it’s the three-position bench or the captain’s chairs. The middle seats are also easily folded to allow third row access without contortions. The front buckets are reasonably supportive, the sloping hood and lofty seating position combine to create excellent forward sightlines, and interior materials are above average even in the basic trim level. Like almost all the vehicles in this busy class, the new Ascent is competent on pavement. Pushed hard in corners, the Ascent will resist turning, the resistance in direct ratio to the how hard the driver is pushing. It’s called understeer, and it’s common to every vehicle in this class. But none of these vehicles have sports car pretenses, and the Ascent’s dynamics rank in the upper echelons of the segment. Body motions are well controlled, transient responses are prompt, and the firm ride quality enhances a sense of sportiness. 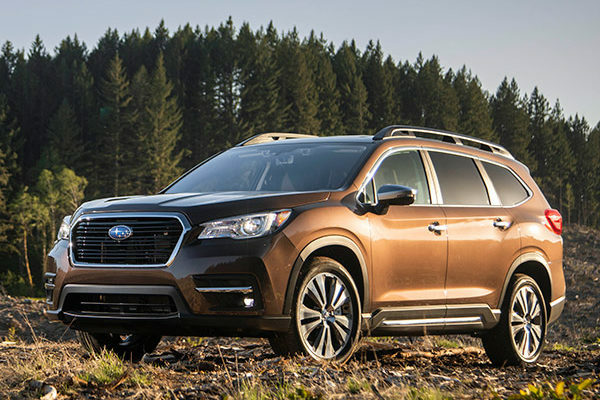 The Ascent can also tackle moderately difficult off-road use, thanks to Subaru’s Symmetrical all-wheel drive system and 8.7 inches of ground clearance. If there are any demerits they’re for an electric rack and pinion power steering system that’s numb below about 50 mph, leisurely responses to paddle shifts, and a little more road noise than is common in this class, particularly on grainy concrete pavement. On the other hand the power of the new turbocharged engine delivers satisfying thrust, with 260 horsepower, 277 pound-feet of torque. The torque is typical of a Subaru flat four (the cylinder banks are 180 degrees apart), particularly with turbo boost, peaking early (2000 rpm) and going about its business with a little less of the growl that has characterized some previous versions of this trademark design. Expect 60 mph to come up in about 7.5 seconds or less, which is in the acceleration ballpark for this class. Beyond that, the action of the CVT pretty much eliminates the irritating wheezing, a sense of the engine and transmission dancing to different beats, that used to be a characteristic of this type of gearbox. Family-oriented crossovers aren’t noted as a source of driver gratification, but the Ascent delivers more of it than most. The new Subaru Ascent is a strong contender in this class of crossover.